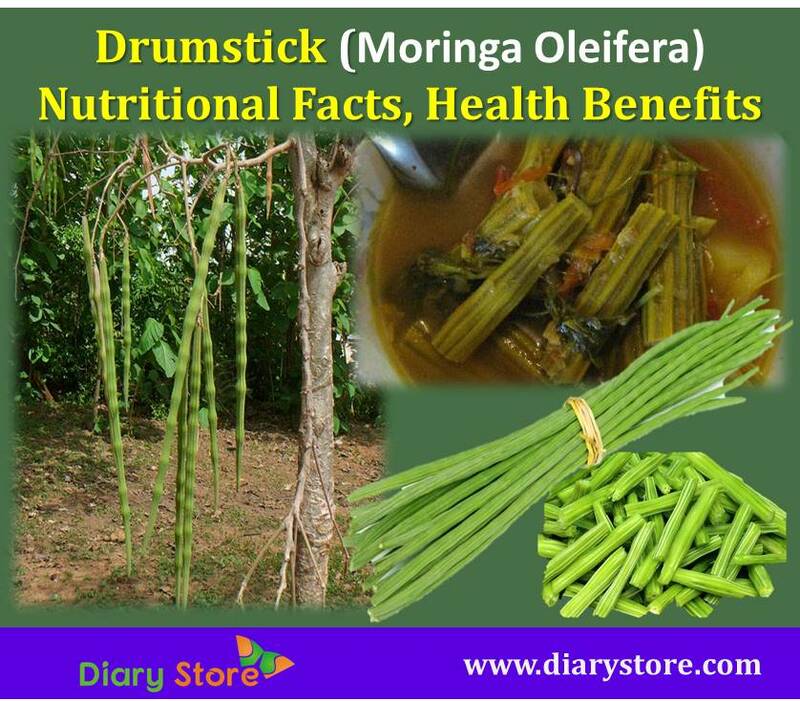 Drumstick is also referred as Moringa Oleifera. Phytonutrients are present in Drumsticks for preventing various conditions such as cancer, asthma, high cholesterol, high blood pressure, anemia, obesity and the phytonutrients improve immune system. The powdered leaves of drumstick also have health benefits related to allergies, stomach disorders, edema, eye protection, diabetes cure, hair care, healthy skin, bone health, cardiovascular health, wound healing. It is also rich in antifungal and antibacterial properties that help to fight against infections. Drumsticks belong to Moringaceae family. They are native to India and they are widely cultivated in tropical and subtropical areas all over Africa, Asia and South America. Drumstick tree has different names viz., horseradish tree and Ben oil tree. Drumstick leaves, oil, bark and roots can be used to make a variety of dishes. Leaves can be added in soups, sauces and oil is used for cooking. Leaves are also used in traditional medicines in several countries and for cleaning walls and utensils. Drumsticks have nutrients, minerals and proteins. Here we list the nutrition value per 100 grams (3.5 Oz) and percentage of RDA (Recommended Dietary Allowance). Drumstick pods and leaves have vitamins, calcium and iron. The pods and leaves are beneficial for pregnant women helping in easy delivery. They reduce pre-delivery or post-delivery problems and also improve production of breast milk soon after giving birth. But moringa bark and roots are dangerous for ingestion during pregnancy because they can have abortive effect. Drumsticks have essential minerals like phosphorous and calcium which help for maintaining healthy bones. Drumsticks also have anti-inflammatory properties which help to treat the conditions like arthritis andheal various bone ailments such as jaw bone fractures. Moringa seed oil and leaves are beneficial for skin and hair. The leaves are packed with many nutrients such as vitamin B, C, A, K and beta-carotene and the oil contains behenic acid. Seed oil is used for homemade facial masks and body masks. Leaves and oil help to remove of black spots, rid fine lines, acne marks, acne scars and give brighter skin tone and also protect hair from environmental damage and strengthen the roots and stimulate hair growth. Drumsticks contain high amount of vitamin C which helps to fight against cold, flu and other infections. Take drumstick soup to get relief immediately. 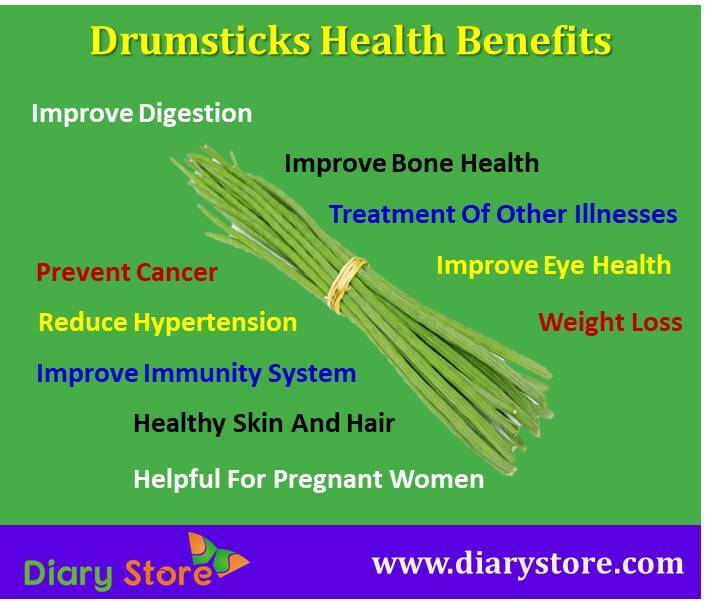 Drumsticks also contain therapeutic qualities which are beneficial for reducing asthma, wheezing and other respiratory system problems. Pods and leaves of drumsticks have B complex vitamins such as folic acid, pyridoxine and riboflavin which help to regulate the digestive process by helping in breakdown of proteins, fats and complex carbohydrates into their simple forms. Add drumstick pods and leaves in your diet and stay healthy. Drumsticks are have bioactive components such as niaziminin and isothiocyanate which helps to prevent thickening of arteries and reduce the development of pulmonary hypertension and the high fat raise in the liver, kidney and serum cholesterol levels. Drumsticks are have vitamin A, C and B-complex and other antioxidants which help to inhibit the growth of free radicals. Free radicals cause cancer. Consumption of drumsticks prevents spread of cancer cells. Drumsticks are used as medicine in various cultures. Their roots have antibiotic properties and are used for a variety illnesses and conditions such as digestive disorders, skin disorders, inflammation, gastritis and thyroid problems. Drumsticks have powerful antioxidants which help to prevent cataract and keep eyes healthy. Add drumstick leaves in your diet to improve your sight. Drumstick flowers also help for weight loss because they contain diuretic properties which help reduce water retention and bloating. If you take painkillers and antibiotics as medication consume drumstick flowers which help protect against tissue damage caused by drugs.